Synthetic polymer protection in a paste! 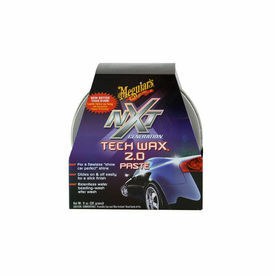 Meguiar’s NXT Generation Tech Wax Paste is the wax for today’s modern paint finishes. Reflective synthetic polymers provide durable paint protection and an incredible shine. Meguiars NXT Generation Tech Wax Paste 2.0 gives you all the benefits of a paint sealant with the shine and application of an old-fashioned paste wax. The polymers bond to your paint and shield it from moisture, UV rays, and corrosion under a glossy micro-thin shell. Because it’s a paste, this barrier is harder and more durable than even your favorite synthetic liquid. It’s the best synthetic protection you can give your vehicle. In addition to protection, Tech Wax Paste creates the ultimate high-gloss shine that is deeper, wetter, and more reflective than anything you’ve experienced before. Reflections are mirror-sharp and light refracts off every curve like cut glass. To further enhance the gloss, Tech Paste Wax eliminates fine scratches and swirls so the shine is uniform and clear. Tech Paste Wax is the next generation of synthetic waxes. The thick paste formula will produce a remarkable deep gloss with outstanding polymer protection to maintain all modern clear coat and multistage paint finishes. Description Synthetic polymer protection in a paste! Darker, richer, clearer gloss Xtreme, synthetic polymer protection Eliminates fine scratches & swirls Meguiar’s NXT Generation Tech Wax Paste is the wax for today’s modern paint finishes. Reflective synthetic polymers provide durable paint protection and an incredible shine. Meguiars NXT Generation Tech Wax Paste 2.0 gives you all the benefits of a paint sealant with the shine and application of an old-fashioned paste wax. The polymers bond to your paint and shield it from moisture, UV rays, and corrosion under a glossy micro-thin shell. Because it’s a paste, this barrier is harder and more durable than even your favorite synthetic liquid. It’s the best synthetic protection you can give your vehicle. In addition to protection, Tech Wax Paste creates the ultimate high-gloss shine that is deeper, wetter, and more reflective than anything you’ve experienced before. Reflections are mirror-sharp and light refracts off every curve like cut glass. To further enhance the gloss, Tech Paste Wax eliminates fine scratches and swirls so the shine is uniform and clear. Tech Paste Wax is the next generation of synthetic waxes. The thick paste formula will produce a remarkable deep gloss with outstanding polymer protection to maintain all modern clear coat and multistage paint finishes.